Mutations in a gene can have profound effects on the function of a protein. This analysis tool highlights the gene location (i.e., the site of a SNP). Mapping tool displays the position of a SNP on the gene, the UniProt sequence, and 3D structure. 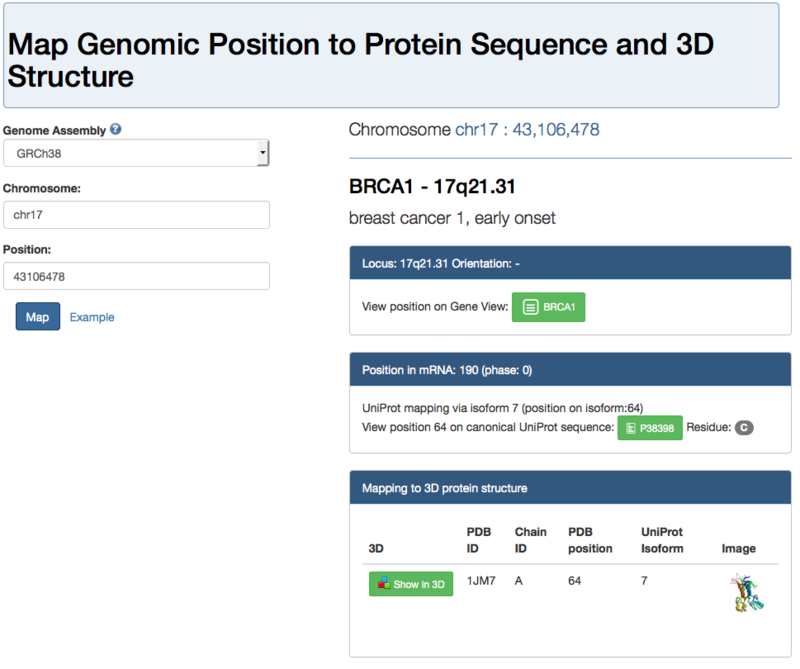 By clicking on the green buttons, the consequences of this SNP at the gene, protein, and structure levels can be explored. The genomic location of this SNP is highlighted by red bar at position 43,106,478. This gene is read in reverse direction; therefore, the complement to codon ACA is TGT, which corresponds to a cysteine. A red box highlights the Cysteine at UniProt position 64. From this diagram we can see that this position is part of a Zinc finger domain (Pfam track). The structural consequences of a mutation at this position can be analyzed by visualizing this residue in the 3D structure. 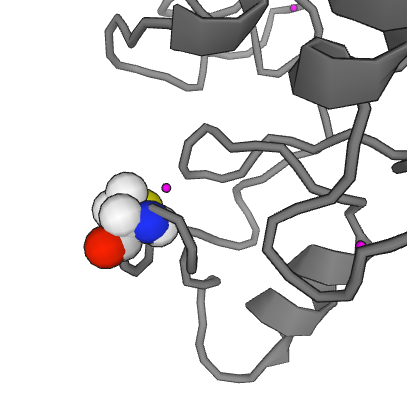 Cysteine 64 is highlighted in CPK style using PV. This cysteine forms part of a zinc finger domain and the sulfur of the cysteine (yellow) is coordinated with the zinc ion (purple). Disruption of this interaction has serious functional consequences and has been indicated in breast cancer formation.